Updated PES hoop list. Added 180mm x 300mm, 360mm x 200mm, 300mm x 100mm to the PES hoop list. To see the new hoops in the list, click the "Defaults" button after the update has been installed. PES 360 x 360 Jumbo hoop has a name change. It is now named Jumbo Frame 14" x 14". 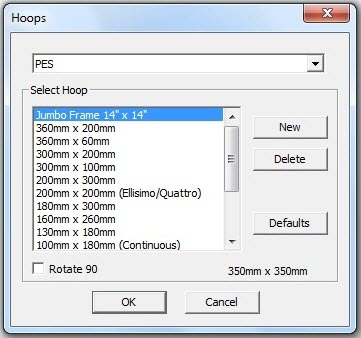 When selecting the Jumbo Frame 14" x 14" you will see the maximum design size of 350mm x 350mm appear in the bottom right corner of the Hoops dialog box. 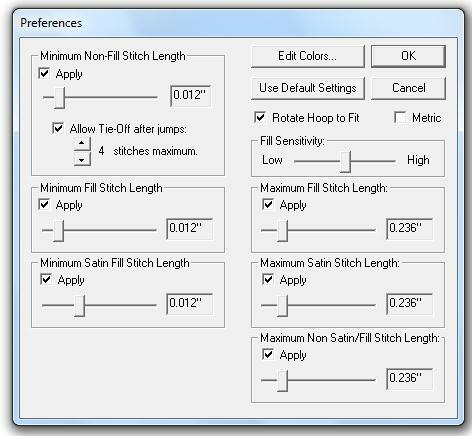 Maximum Non Satin/Fill stitch length setting has been added to the Preferences. Default setting is "on". This setting will concentrate on "Non-Fill/Satin" areas such as underlay. A .TXT file is automatically created when a file is sized for the Jumbo Frame 14" x 14". The .TXT file has the color sequence for both segments of the split Jumbo file. Added the 360 x 360mm Jumbo hoop for the BNT10/Enterprise. If HoopWorks Stand Alone is installed along with this current version of SizeWorks 2.10, 360 x 360mm files will be auto-split when saved. Compatible with Studio III 3.10 update and later. Note: Studio Plus users will need to upgrade to Studio III version 3.10 to have the ability to use 360 x 360mm Jumbo hoop features. This update will convert your SizeWorks into a stand alone program. It will still work with the platform you currently use. Please read the information included with the download for additional information.